Ben Watson has backed Wigan Athletic to consolidate their place in the Championship after helping Nottingham Forest to pinch a point in a smash-and-grab raid at the DW. Forest denied Latics all three points with a stoppage-time equaliser on Saturday, after the ho me side had twice led through Nick Powell and Will Grigg. And Watson, Wigan’s FA Cup final goalscoring hero, believes his old club have more than proved they belong back in the second tier. “Wigan will be looking to hold on to their Championship status this year, and that’s the start,” he told the Wigan Post. 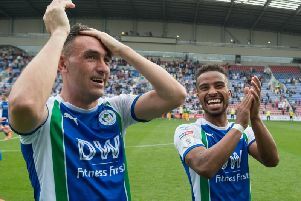 Watson was particularly impressed with Powell, with whom he played during the 2013/14 campaign when Latics reached the semi-finals of both the play-offs and the FA Cup. “Powelly’s Powelly, he was like that the first time he was here,” acknowledged Watson. “Ability-wise he’s up there with anyone in the Championship. “And if they can keep him fit, he’ll score goals and he’ll also create goals. There was a special moment in the first half when Watson – who came off the bench just before half-time – was sent to warm up, and ended up enjoying a moment with Callum McManaman, who was among the Wigan substitutes. “It’s always nice to catch up with the boys who were here for the FA Cup win,” added Watson. “I’ve not seen Cal for a while, but I just said to him to keep his head down, keep working hard and get his place back in the team.